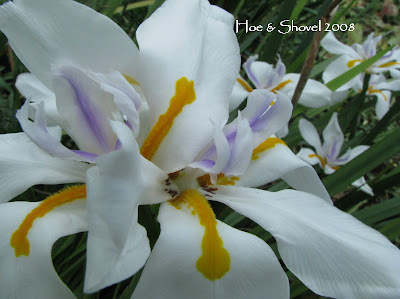 Even though the drought tolerant African Iris Dietes iridioides (sometimes called Fortnight lily or Morea iris) adjusts to dry weather, it really loves to show off after a good soaking. I know I've sung the praises of these evergreen perennials in other posts. So please bear with me. But just as the sun was dispelling the darkness this morning I looked out my kitchen window. Like brilliant white stars in the barely lit morning, so many African Irises were looking back at me with oh so much fervor that I just had to get out and snap their loveliness once again. The way they bloom over and over again all spring and summer just never ceases to amaze and thrill me. And just how does the grouping in one bed know that the groupings in the other beds are ready to bloom? This is a wonderment--- how they have some kind of built-in, silent signal to each other to perform simultaneously. I won't go into all the positive attributes of African Iris --but if you're interested you can click here for a previous post that espoused all of their wonderful traits. Since I did take more photos I thought I'd display the close ups and also give you views of how they fit in the plantings where they become the focal point at each flush of blossoms. These "clumps" are just beyond the screened lanai and just to the right of the pathway leading from the brick patio out to the back garden. I was happy to dig out a few from this planting a few weeks ago to pass-along to my mom. She said hers have already bloomed too. 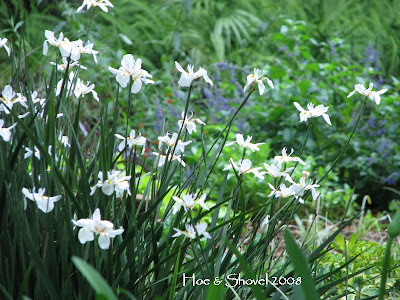 African Iris are very easy transplants that adjust well with hardly an indication they've been divided and moved. Oh, I could go on and on about how Florida friendly they are. Some people have asked about trimming them. I don't trim mine. I guess if they were burned in the freeze I would have but if not, I don't see any reason to do this... they just live on in all of their greenery probably getting to maximum height of about 3-4 feet. There is one more "clump" of blooms in the very back of the raised brick wall planting that I didn't photograph (just forgot since I don't see it unless I walk around there). 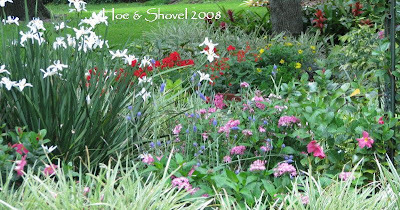 I do have a few in containers too that also bloomed... not as glorious a sight as the concentrated areas for certain. We didn't get a gusher of rain last night but it was the first drop in over two weeks so we are grateful. While I was out clicking away this morning I happened to notice the very first Zinnia is unfurling. I was happy to see it is going to be pink! This is the first time ever I've seed sown any flowers. I know, it just doesn't seem possible but it just isn't the practice down here... at least not with anyone I know. 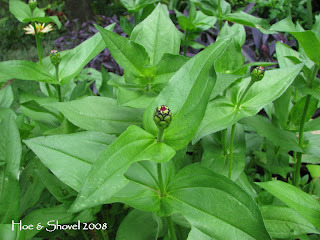 I direct sowed Zinnia seed in three different places on March 13 and they are all full of buds. Grasshoppers and slugs have done a bit of damage but other than that ... I think we are going to have a pretty display within the next week. Since then I have direct sown some more flower seeds of different varieties. April is just too fun with so many plants and flowers having their best times here before it gets too hot. May should prove to bring us even more color when my beloved caladiums make their way out of the ground into their fullness. I don't do a lot of seed sowing in my garden either, but my daughter found some room to sow zinnias, nasturtiums, and cosmos this year, and they're all doing great. The zinnias aren't blooming yet, but the cosmos are. Echinaceas are also easy to sow from seed. I just flick the dried cones in the fall, and the seeds fly out and eventually take root. What lovely color combinations! I love the variety of textures in your gardens. Isn't it wonderful when everything is bursting with blooms? Meems, your garden is awesome! What a beautiful iris that is. How wonderful something that beautiful is also so sturdy. I'd love that iris in my garden. The flower is great but the fact that it keeps reblooming makes it even better. I knew when I saw the first photo it was too good to be true. Here it would be an evergreen annual at best. I guess I'll just keep dreaming of that ever-blooming German Iris. The African Iris are just gorgeous - they sound like a faithful performer all spring and summer long. I like the idea that they signal to each other, from one bed to the next, that it's time to bloom! This is a new plant to me but I have made a note to see if it is available in the UK. What a lovely plant, it must look cooling in your hot climate. The pictures showed an amazing garden, you must work very hard because if your plants grow all year around then so do the weeds! I can't imagine working in a fraction of the heat you get, I am very impressed. I had a chuckle - you get slugs too, does anyone have the wrong climate for slugs and snails? 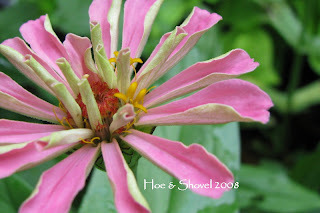 I adore zinnias for their brilliant crayon colors! Make sure you photograph them for us when they're at their showy best. :) Your gardens look wonderful. Pam: I like your seed sowing methods for Echinacea. I have sown some this spring from the traditional store-bought package. I also sowed some Rudbeckia Triloba- never have grown this before... and some coleus seed- which will be real fun to see if anything happens with them. Oh-- AND marigold from seed in my vegetable garden... they are starting to bloom too. Linda: You said it well... beautiful AND sturdy... certainly a valuable combination for Florida dwelling. WiseAcre: I think you probably have lots more choices for irises in your clime than we could ever think of down here? For the first time I'm attempting to grow Louisiana Iris... planted some bare root a few weeks ago... it remains to be seen if they do well or not. Kate: I just think the fact that they all bloom at the same time is remarkable... my next door neighbor's irises don't here the signal apparently... his are on a totally different rotation than mine. 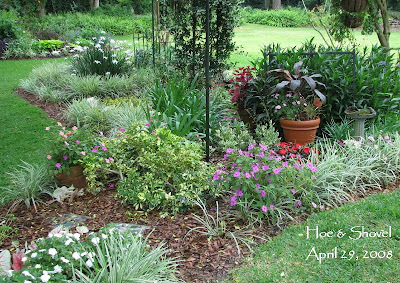 Helen: I'm not sure what zone you are in but I know their hardiness is Zone 8-10 -- as a perennial. Otherwise as WiseAcre noted they could be grown as an annual or perhaps indoors but probably not with the same performance as down here in the tropics. Sylvia: Thank you for the kind words. We do "grow" weeds year round and if we don't have a hard freeze (which is rare) at least once a year they don't slow down a bit.It is part of the trade-off for tropical paradise I guess. Yes, slugs must endure every imaginable climate and condition ... too bad ... they can do some lightning fast damage! Do you have a blog? I haven't been able to link back to you??? nancy: It's funny that I thought of zinnias as too common to plant because as a child we used to sow seeds and they were so easy. So easy? That's what I need now... some 'so easy' plants... the more the merrier. I am enjoying seeing them come to life and YES I will definitely snap away as they unfurl their rainbow of colors. What a wonderful picture of the African Iris blooms! I've been trying to get a good shot for a couple of months - and have been unable to capture the beautiful details of the bloom. Friday we moved a huge clump from my garden to one of my daughters - another bonus of African Iris - they don't mind moving around! Mary Beth: Are your African Irises the same as these? Seems I made a mental note yours were the pale yellow variety... maybe you have both? I just love their versatility... and yes, they can be moved quite easily. They spread on their own so I have to be sure when I move them that I'll be happy with their height and with them getting much wider than they start out. I didn't read everyone's comments but that seems really fast for the zinnias to set buds? They must love your garden. I know I do. Your up close photos and then showcasing those plants as a whole of your gardens is just beautiful. Your garden has so much flow and balance. Anna: Thanks.Hopefully the zinnias do love my garden because they have a long season to make their performance a good one. I will probably sow more seeds in aug/september for the fall... we'll see. Sorry but I don't have a blog, though I do have a garden! 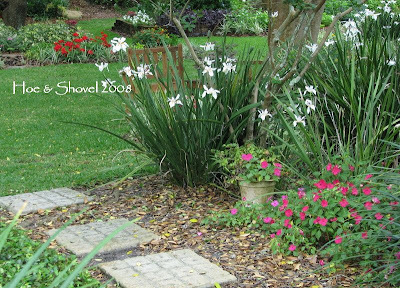 I do try to show my appreciation for all the hard work that goes into the garden blogs by leaving a comment occasionally. Thank you I really do enjoy reading your blog about gardening in conditions so very different from my own. sylvia: Thank you for commenting... I'm glad you visit even though you don't have a blog... and I'm glad you enjoy gardening too.